In my Twitch channel, I'm going to live stream my screen. 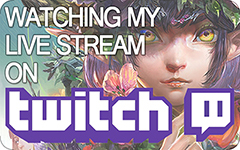 Most of the contents would be my painting stream, but sometimes also would be gaming stream. Because I don't have a schedule about streaming, welcome following my channel in order to receive an informed message from Twitch and catch up with me! Browsing the illustration through GALLERY / FAN ART.